Last week I asked you to share your Sophies with something spotty to celebrate “chickenpox month” in our house. Here is my something spotty. It is not nearly as spotterific as Phaedra’s Photo (which had a spotted dress, spotted tea cups…basically spotted everything), but this dress holds special memories for me as I wore it with each of my 3 pregnancies. Sophie is my yarny baby, so this memory had to become part of her. What an epic, surprising, exhilarating (and exhausting) journey this has been so far. You guys have made me feel rich beyond words with all your kind comments and encouragement. May we all continue to have fun as the CAL starts to wind down. 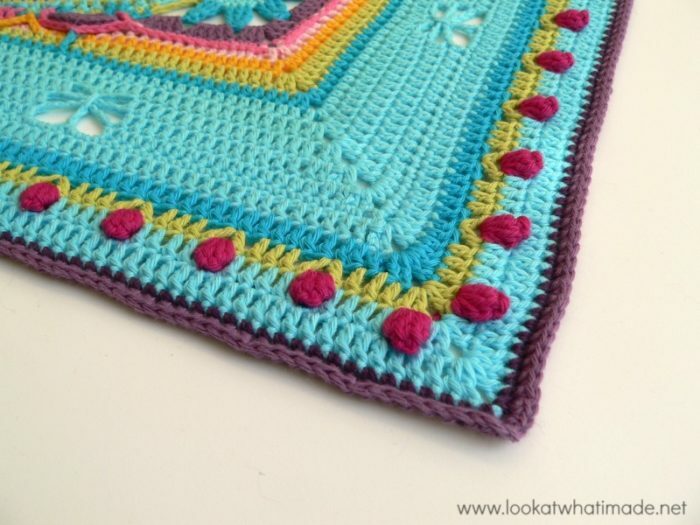 **Part 16 VIDEO TUTORIAL** by Esther Dijkstra from It’s All in a Nutshell. *This is the last time that you will be using Pink (medium size), and Blue Apatite and Green Agate (large size). Please see THESE TABLES for yardages. Persian Stitch: Sc2tog, with the first leg of the sc2tog falling in the same st as the last stitch (see Round 104). You can find the links for Rounds 1 – 101 HERE. If you are using the same colour, sl st into the next 2 dc’s and into the ch-2 space. (Ch 3, dc, ch 2, 2 dc) in the same ch-2 space. If you are using the same colour, sl st into the next dc and into the ch-2 space. (Ch 1, sc, ch 2, sc) in the same ch-2 space. 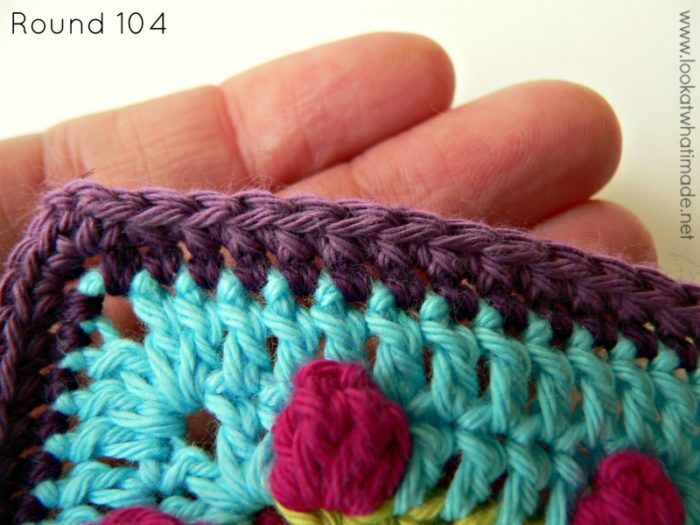 In this round, you will be making the Persian Stitch. This stitch is basically a sc2tog (single crochet 2 together) without actually decreasing. 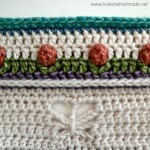 The Persian Stitch creates a dense, textured band on the front of your work (Photo 11). From the back, it will look almost like a blanket stitch (Photo 12). The top of your stitches will curl forward. Don’t worry about that. I have used Light Green in the tutorial photos to make it easier for you to see what I am doing. 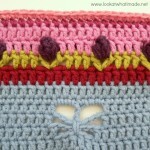 Make a sc in the first (hidden) stitch (Photo 2). Make a sc2tog, working into the same stitch and the next stitch (indicated with arrows in Photo 2). 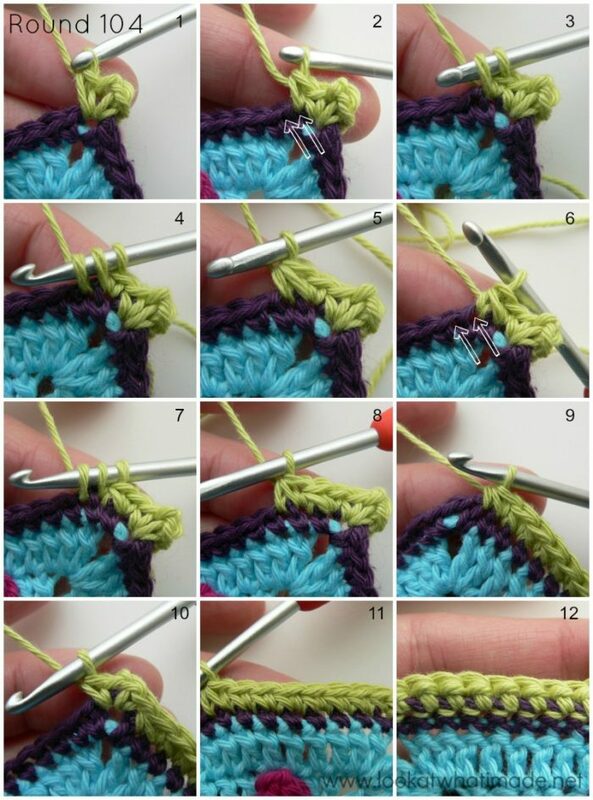 To do that, insert your hook into the stitch that already contains the first sc, and pull up a loop (Photo 3). 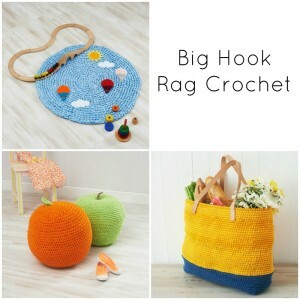 Insert your hook into the next stitch and pull up a loop. There should now be 3 loops on your hook (Photo 4). 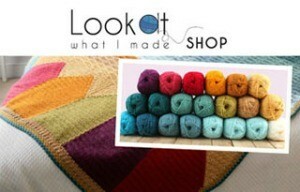 Yarn over and pull through all 3 loops on your hook (Photo 5). 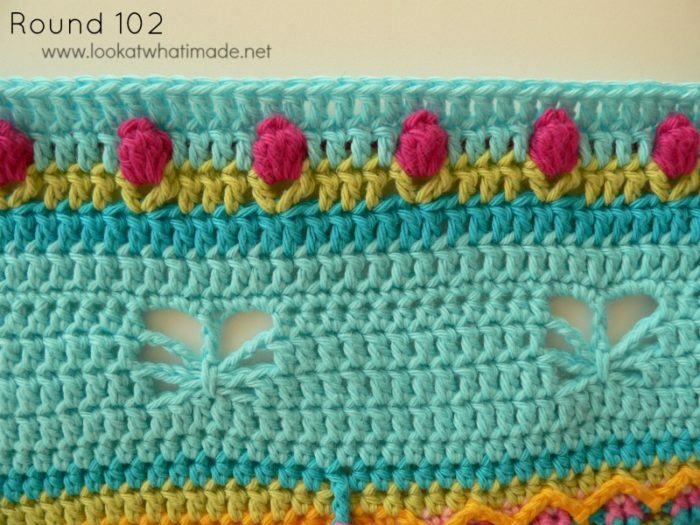 This is your first Persian Stitch made. 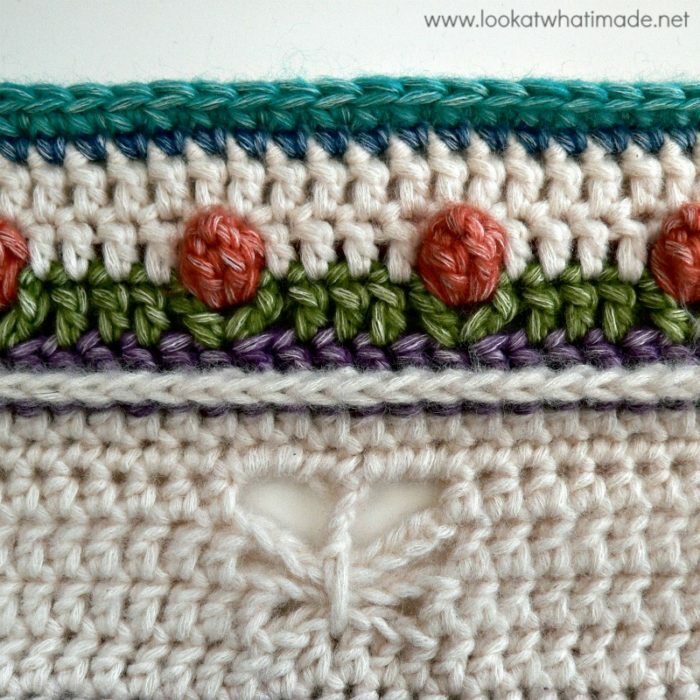 To make the next (and each subsequent) Persian Stitch, insert your hook into the stitch that contains the last “leg” of the previous Persian Stitch and pull up a loop. 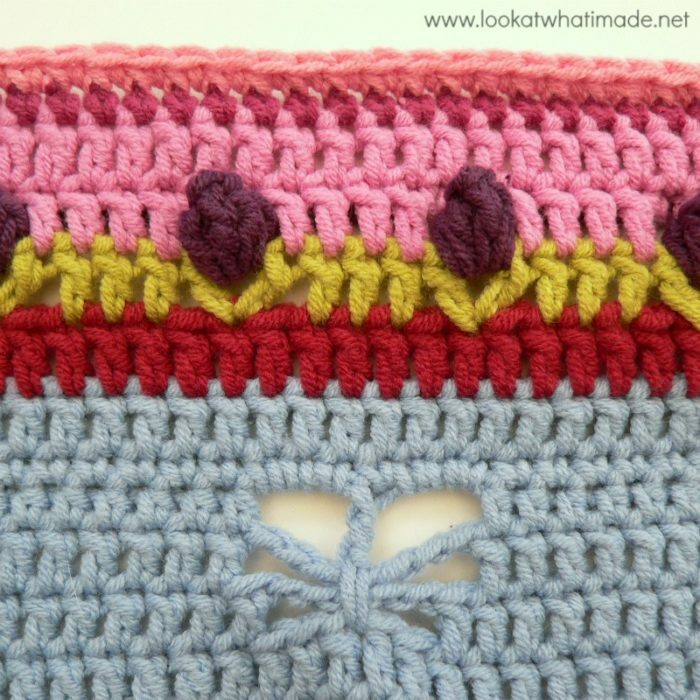 Insert your hook into the next stitch and pull up a loop (indicated with arrows in Photo 6 and illustrated in Photo 7). Yarn over and pull through all 3 loops on your hook (Photo 8). This is your second Persian Stitch made. The first “leg” of your Persian Stitch will always fall in the same stitch a the last “leg” of the previous stitch. 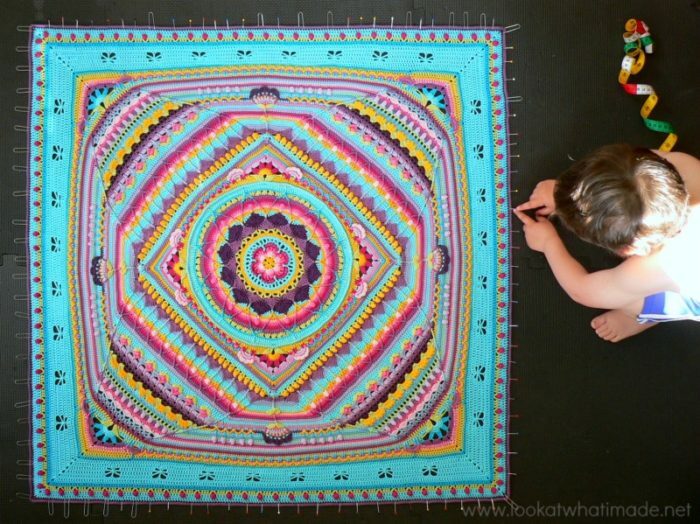 Make 189 more Persian Stitches. The last stitch should fall over the last 2 sc’s before the ch-2 corner space (Photo 9). Repeat from * to * 2 more times. Join to the first sc with a sl st. If you want to take pretty pictures, block, block, block. 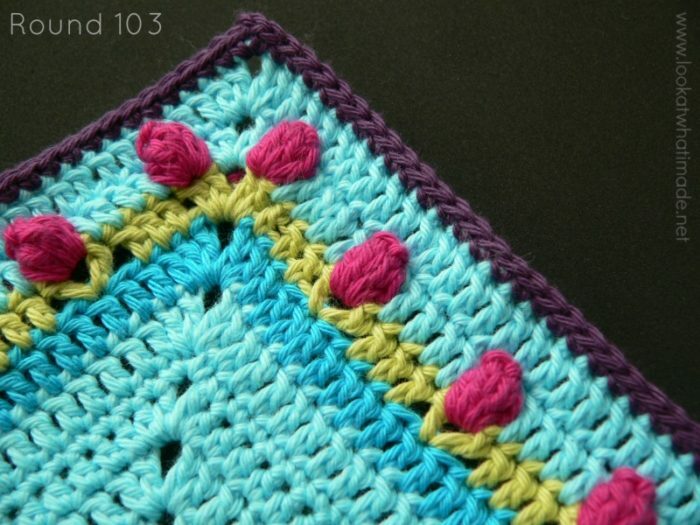 I have yet again lost most of my blocking pins, so I am having to use regular pins as well. And they work just fine! PS: doing my Sophie in bed gave me the opportunity to actually see just how big she is-almost the top of my queen bed! Haha. Have you figured it out yet? 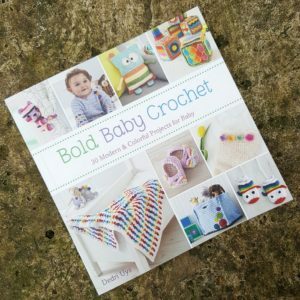 I’ve loved doing this project, thank you so much for making it available! And for free..you’re amazing and generous. 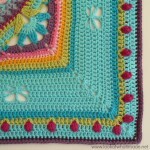 I have to say the Persian stitch would have to be the most boring round ever! Lol its beautiful to look at but a drag to do ;) ps I’m already planning my next Sophie, I just love it, thank you again. 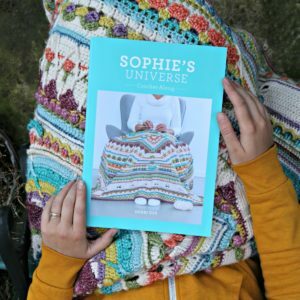 Hola Dedri, feliz con Sophies, es una creación maravillosa…Estoy esperando la parte 16 en Español que se ha demorado mucho…Muchas gracias !!!! 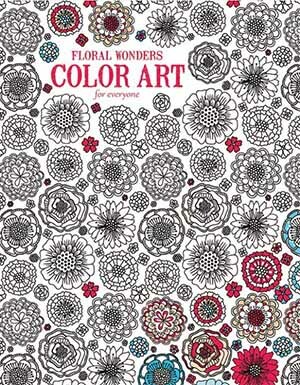 I am only in the 50 rows, just completing the fun Roses. I have loved every row up to now and cant wait to catch up. Fantastic insteuctions and photos, easy to follow. Well done Dedri. 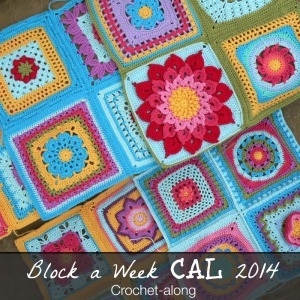 Even though I’ve only gotten through Row 52, I am loving this project so much and learning a great deal. 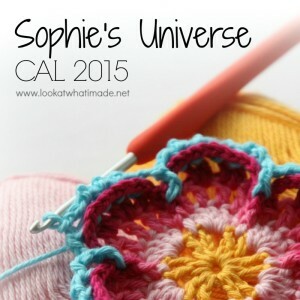 I learned to crochet beginning on Jan 25, 2015, and after a zillion granny squares, decided my crocheting needed a direction, and that’s when I found Sophie’s Universe. I’ve had to take a hiatus to knit a christening gown, but plan to be back to it soon, even if I have to crank up the A/C to stay cool under the Universe! Thanks for sharing your great creative talent. I finally got caught up and was waiting anxiously for part 16. 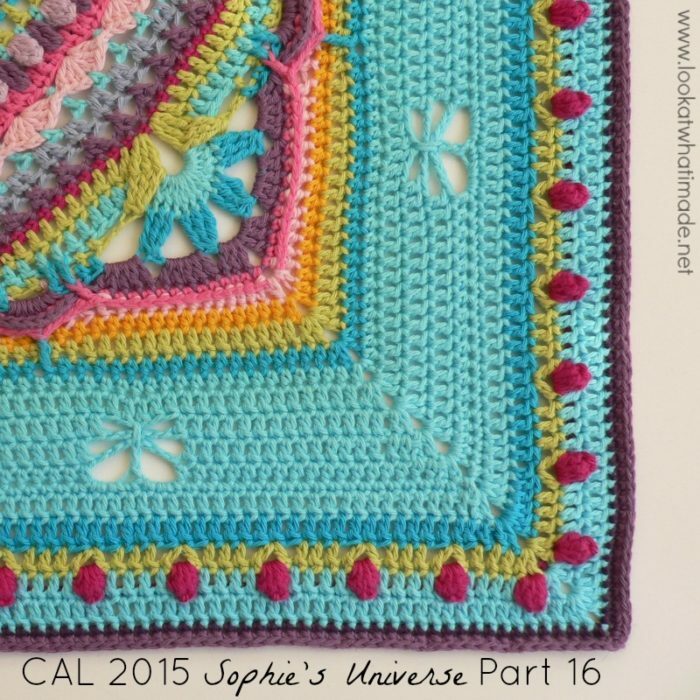 I have so enjoyed doing Sophies Universe. 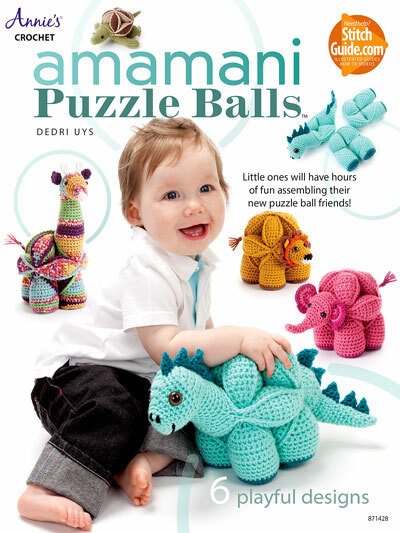 Thank you so much for sharing the pattern with us. You are a sweetheart and am so glad you are not seeing spots everywhere. Hee Hee. Glad the children are better. it is finally time to thank you for your effort. The time and creativity that you use to create such a wonderful piece, and it make possible for us to meke it for ourselfs too, and all this for free, is so generous and incredibly kind! 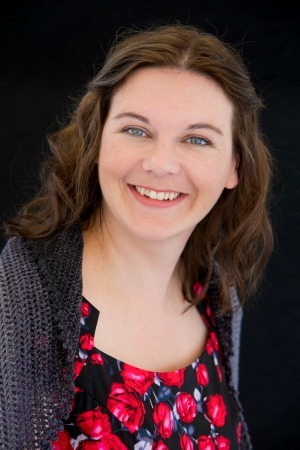 I just want to say “THANK YOU”….I cannot think when I have enjoyed a project so much! Have a wonderful week! Hi, I hope 16 is not the last of your Sophie ??? 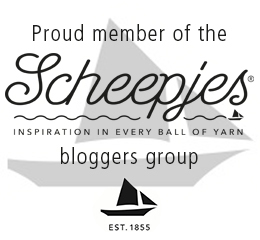 I’m new to crocheting having been a knitter for 50yrs I decided I needed a challenge . 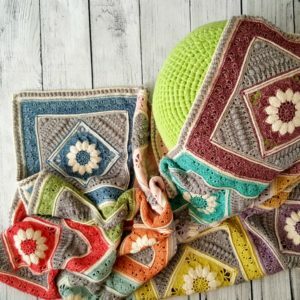 I’ve been doing my Sophie from my enormous DK stash from years of family knits, all my children, family and friends so every yarn has a memory. Not the most colour coordinated project but we love it, hoping it will get big enough for our bed !!! Having so much fun learning all these new stitches. 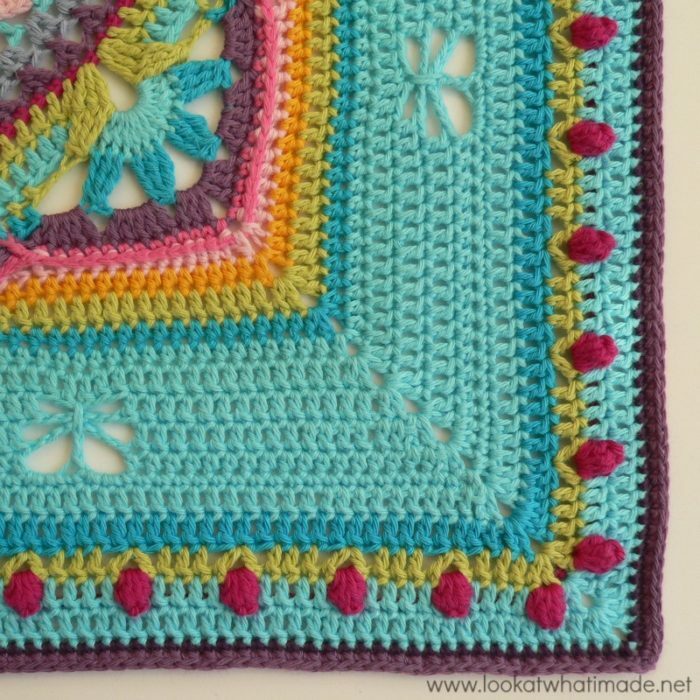 Using the video tutorial from Its All In A Nutshell and I must say she is absolutely brilliant, thankyou so much for this beautiful blanket . Hi Joy. Part 16 is not the last bit. 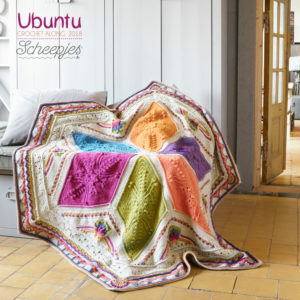 There are 2 more parts, followed by optional squares for those who want to make a rectangle, followed by a final optional border. Esther’s videos are amazing. It’s like she lives in my head. She mentions everything I think is important and her voice is sooo soothing. She has been such a blessing to me in this endeavour. 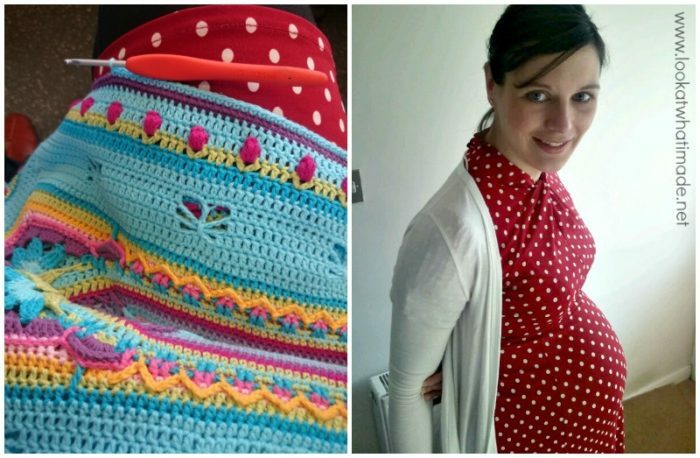 I’m not sure what a waistcoat is, but I’ve seen 2 wearable patterns from Sophie’s U. just today! If you find anything else, please post! Brill that’s it ,the second one. In the UK we call them waistcoats ( well if your an oldie like me ) will definitely have a go at this one. Thankyou so much. Dankie tog Dedri. I really thought this was the last and I am addicted to Sophie. This is a fantastic journey. Crochet is my companion since my hubby past away 8 years ago. I love my son (13) very much but the only way for me to have quiet time is to crochet. The follow on smaller blocks will be a saviour. Thank you for making all of us feel a part of your life with Sophie (or Suzie as my mother calls it).